The Toyota C-HR was a new vehicle last year, and a bit of a mystery. “C-HR” is said to stand for “Coupe, High Riding,” which is a head-scratcher. Whatever it is, it’s a jazzy-looking hatchback that’s one of the more intriguing vehicles Toyota builds. The C-HR shares its platform with other small Toyotas including the Prius and Corolla, on a compact-sized wheelbase of 103.9 inches. But the C-HR is meant for the young crowd, who might think those vehicles are for a later stage in life. For 2019, the C-HR adds two models and takes away one. In 2018 its introduction year, there was an XLE and XLE Premium; now Toyota sells a base LE, XLE, and Limited. The C-HR LE costs $1,300 less than last year’s XLE, and gets a bigger touchscreen with Apple CarPlay compatibility. 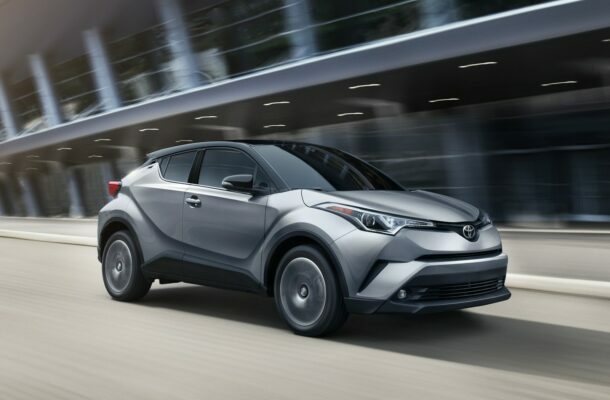 The front-wheel-drive C-HR is powered by a 2.0-liter 4-cylinder engine that makes 144 horsepower and 139 pound-feet of torque, coupled to a continuously variable transmission (CVT). The C-HR weighs 3,300 pounds with no passengers, so accelerate is moderate. The EPA rates the 2019 C-HR at 27 mpg city, 31 highway, 29 combined. The Toyota C-HR gets five stars overall in crash safety from the NHTSA, with four stars for frontal impact and rollover prevention. The IIHS gave the C-HR top “Good” scores on all its tests, including the new passenger-side small-overlap crash test. The IIHS also rated the small Toyota’s automatic emergency braking system as “Superior” in preventing forward crashes, but called its headlights “Poor,” even with automatic high beams. Impressively for a low-priced compact, standard equipment includes automatic emergency braking, forward-collision warnings, active lane control, automatic high beams, and adaptive cruise control, as well as 10 airbags, a lot for a compact car. Blind-spot monitors are optional. The new base C-HR LE model starts at $21,990 and comes with cloth upholstery, daytime running lights, 17-inch wheels, the advanced safety features (called Toyota Safety Sense-P), dual-zone climate control, Bluetooth connectivity, and an 8.0-inch touchscreen for infotainment with Apple CarPlay compatibility. The new Limited model, for more than $27,000, adds leather upholstery, front seats with power lumbar adjustment, premium audio, 18-inch wheels, blind-spot monitors, keyless ignition, and fog lights. The C-HR is without a doubt stylish and expressive, even extroverted. It manages to look smaller than it is, even with its high stance and many curves and slits. The busy rear end sticks out, with bracketed taillights that are as bold as the rest of the car. Designers paid a lot of attention to details. The rear door handles are hidden within the pillars, which turn upward at the tall back end. Cat’s-eye headlamps flow into the front fenders and wrap into the wheel wells. A rising window line under a sloping roofline attempts to mimic a two-door coupe—thus the name. The expressive exterior forces compromises in the cabin, as wild shapes take up space and block some of the view to the rear. Toyota calls the central control pod the MeZone. Controls for the 8.0-inch touchscreen mix stylish knobs with switches. As a design theme, diamond shapes turn up all over the place, from the headliner to plastic door panels. Soft-touch surfaces mix with hard plastic. Storage bins and trays are plentiful. The front seats are supportive and reasonably roomy, but sit rather low. The wide and upright rear seat is higher, yet there’s still good headroom, though with only 31 inches of legroom it can get snug for tall passengers. Unlike many small crossovers and hatchbacks, three adults can actually fit in the back seat of the 2019 C-HR without undue discomfort. The C-HR has 19.0 cubic feet of cargo space behind the second row, which expands to a modest 32.4 cubic feet with the seats folded to form a flat but high load floor. The base infotainment system is not particularly intuitive. But at least for 2019 there is Apple CarPlay, with a popular smartphone interface; Android Auto users are still left behind, but Toyota is working on that integration. The C-HR may look zippy, but its powertrain delivers just modest acceleration, even in Sport mode. There are three drive modes: the fuel-efficient Eco, Normal, and Sport, which firms up the steering and programs the CVT with seven simulated gear ratios. Handling and roadholding are significantly sportier than the powertrain. Engineers gave the C-HR front struts with Sachs dampers and a beefy front stabilizer bar, and an independent rear suspension with double wishbones. The ride is smooth. The C-HR can be fun to corner with spirit, as it feels secure and well-planted. The steering is neither light nor numb like small cars of the past. The 2019 Toyota C-HR makes its strongest appeal to the eyes. The powertrain can’t match the exuberant body, though it sticks and grips with gusto. Consider it an expressive high-riding hatchback with some of the flair of a coupe, and it makes sense.